I was sitting at lunch with my Mom, I was eating a vegetarian super veggie sandwich and my Mom was eating breakfast with eggs and such. That is her absolute favorite meal on the entire planet. We were talking about my love of healthy foods and where in the world that started. I remind her over and over that she fed us well rounded and amazing food growing up, that created a food loving little girl that is now a food loving adult. I’ve always had a love of food, healthy and indulgent. As for making those better choices, I went for the more nutritious sandwich that day. I have been helping my Mama a lot with her health and I need the energy to keep me going, and basically care taking for two households much of the time. And in general that sandwich is simply a better choice for regardless of what is going on! 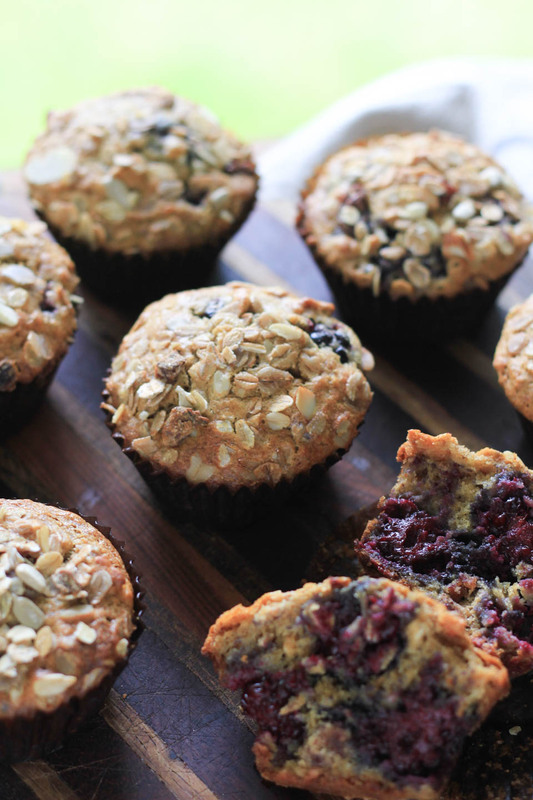 That conversation over healthier foods led us to these more densely nutritious style muffins. She has a love for breakfast foods like I said, and any that I make, she is a happy lady. So when I make muffins, scones, and desserts lately, I make sure that they are lower in sugar and higher in better for us stuff so that she can enjoy them and I feel good about sharing them with her. After recipe testing these a few times to get them exactly how I envisioned, I realized I would much rather a muffin like this and a bran muffin than any other kind. I do love nutrient dense foods, and given the choice I’d eat these any day over a white flour blueberry muffin. They taste better to me! And when I make them for my Mom, she absolutely loves them. 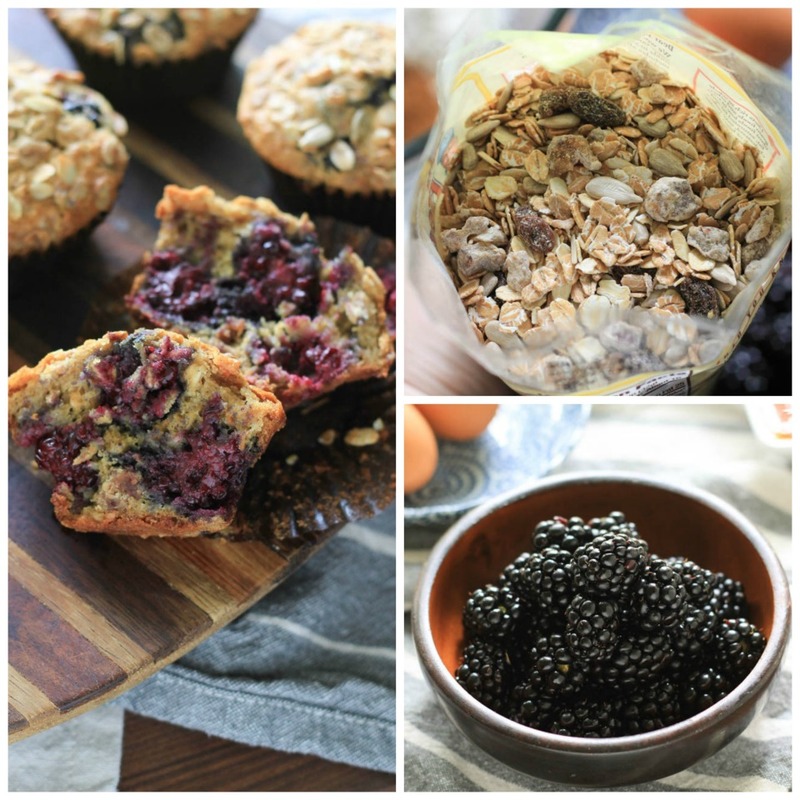 Plus, Brian’s favorite is a blackberry muffins, so the whole family wins with this Blackberry Muesli Muffin recipe! Muesli is so good, full of nuts and seeds, oats, and dried fruit. All of those are Mom’s favorite things. And for me, I love the texture of the muesli and I loved taking these on our hikes to get some much needed energy from all the good stuff. We’re going camping soon and I will totally be taking a batch for our hike! It may not be totally reasonable to travel with a touch of butter for the hike muffin, I’ll save that for the campsite. BUT one of these right out of the oven or warmed up with a little bit of salty butter is quite heavenly. Seriously, butter and warm muffin, that is a good little treat. These are a heartier than normal muffin recipes with big flavor and nutrition. Perfect for a quick morning breakfast, hike bites, on the go snack, and fancy enough for a brunch gathering. Way better than anything you’ll find in the store or corner coffee shop. 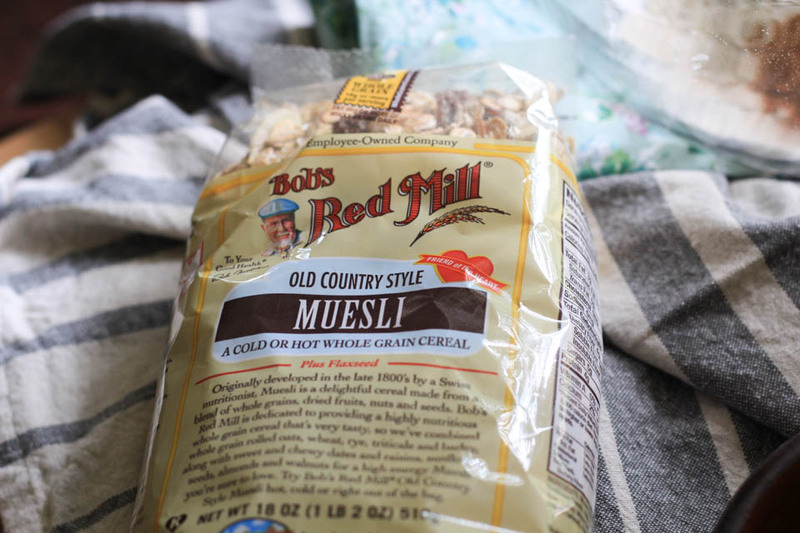 Filled with Bob’s Red Mill Old Country Muesli that has tons of whole grains, nuts, seeds and dried fruit! These muffins are low in sugar, high in fiber, and protein, which will satiate much longer than a white flour sugary muffin. *Baking Tip: The key to tender fluffy muffins- do not over mix and fold batter gently when combining wet and dry ingredients, leaving lumps is key. Place oven rack in center of oven and preheat to 375 degrees. Line muffin tin with 10 muffin liners, spray pan with baking/cooking spray. Place muesli, flour, baking soda, baking powder, salt, cinnamon, and black pepper in a large bowl whisk to combine well. Place buttermilk, oil, eggs, honey, lemon juice and zest in a medium bowl, using a fork, whisk to combine well. Add buttermilk mixture to flour mixture, using a large spatula, very gently combine. Do not over mix. Leave some lumps and dry flour, then add blackberries, fold into batter very gently. Divide batter among 10 muffin liners, filling to rims. Sprinkle tops with reserved 1/4 cup muesli. Place in oven and bake about 20-25 minutes or until a toothpick from center comes out clean. Allow to cool completely on a wire rack. Store in an airtight container on counter for 3 days, then put in fridge for up to 5 days. Or place in a freezer bag and freeze for up to 1 month. Allow to thaw overnight on counter to enjoy in the morning. Can you substitute diced or chopped prunes for berries? These look perfect! I’ll definitely be making them next time my kids ask for muffins! Awesome, thank you so much! I hope they love them like we do! Holy cow, these look so beyond perfect! Love those tops! You are the best, thank you!!! It’s like you knew it was blueberry season and that we are obsessed with muesli!! YES PLEASE!! Totally! We are seasonal eaters for sure. These look absolutely fantastic. Blackberries are one of the most underrated berries, but def one of my favs (especially with dark chocolate). 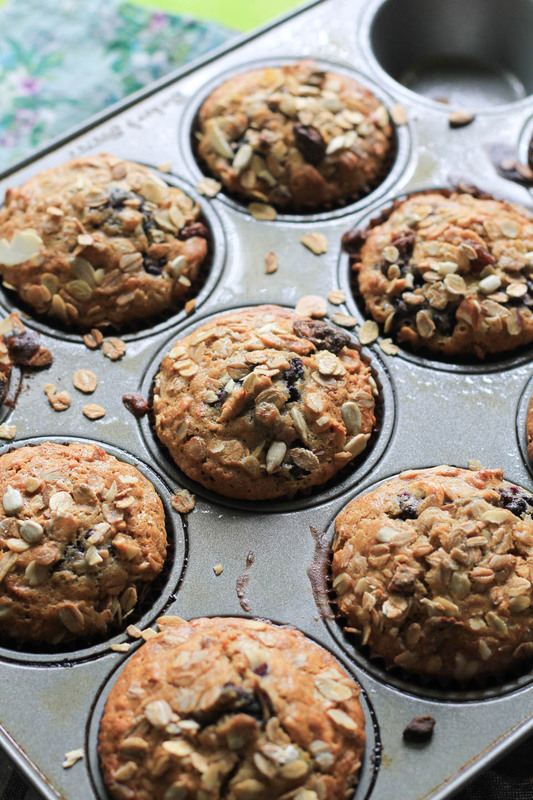 Love the use of muesli in these muffs too — I normally enjoy it with almond milk or make overnight oats but love that you used it in muffins! Thank you so much! I completely agree, they are the best of the berries and with muesli, so good. And I love all the berries. 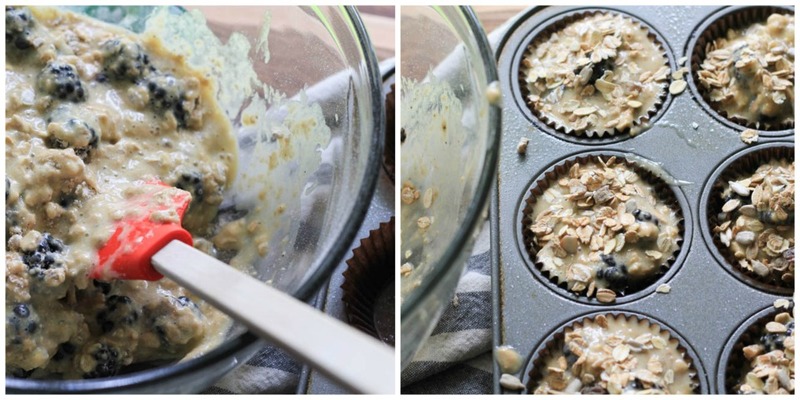 I am so trying to eat better – and these muffins look like the perfect morning start! Me too! This makes eating better so easy, they actually taste good too lol!